Find general information on Lesser Spotted Eagles, sorted by countries or regions. 3. NABU - Naturschutzbund Deutschland e. V.
The Deutsche Wildtierstiftung cooperates with Ornithologists in Latvia to raise and bring "Abel" chicks to Germany to help the LSE population here. 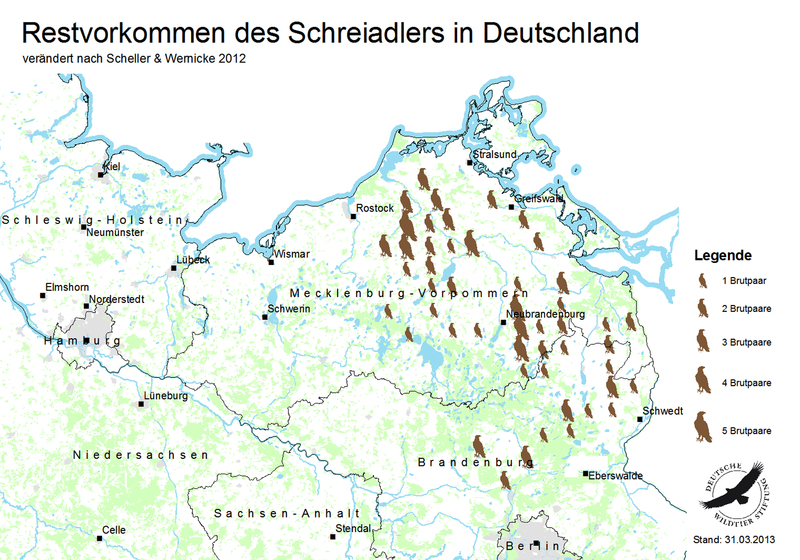 This chapter also mentions sightings of Greater Spotted Eagles (Aquila clanga) in Niedersachsen. NDS is not considered breeding area of GSE, but there have been sightings (including the shooting of the sighted bird) since the 19th century and various museums and collections have specimen of GSE in their stock. In this interview Zeitz Róbert and Daróczi J. Szilárd talk about the biology and conservation of the Lesser Spotted Eagle in Romania. They work with the "Milvus Group" for the conservation of the Lesser Spotted Eagle in Romania and are currently working on a LIFE project for the species. Contains also videos and data about birds with transmitters, a comic, photo gallery, migration blog. In Polish and partly in English. Part of "Life" project. You find News, Information about the Project, information about LSE, Gallery with photos and videos, Eagles in the media and much more on this website!